In South Florida, grilling season is year round! 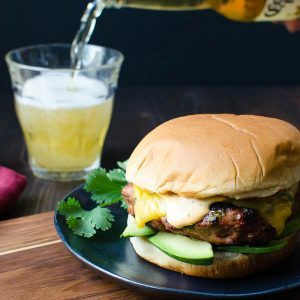 Aside from the occasional torrential downpour or (knock wood) hurricane, it’s always a good time to fire up the grill and this is one of our favorite recipes. 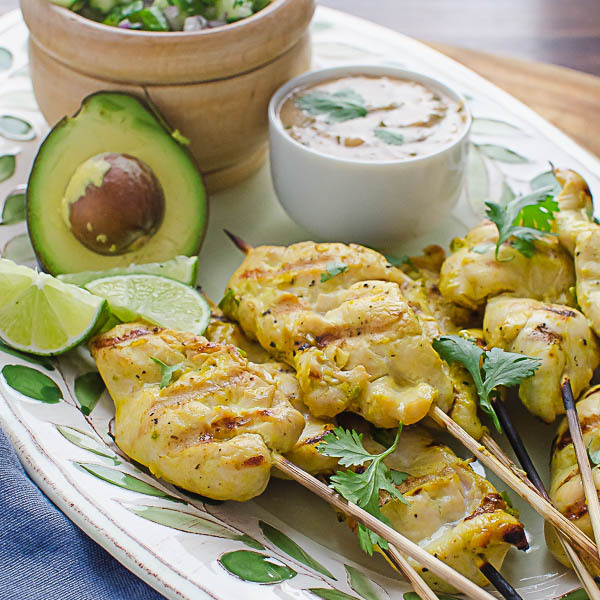 Chicken Sate with Cucumber Avocado Relish. It’s also got a chunky peanut dipping sauce that is lick your lips good! For this recipe, there are a few things I like to make ahead. The dipping sauce, for one. As sublime as it is when you make it, the flavors are even better a few days later, so it’s best to assemble a day or so in advance and store it in the fridge until you’re ready to go. Speaking of storage, I’ve recently been turned on to the New Rubbermaid® BRILLIANCE™ food storage collection — this is their premium food storage and I can see why. Aside from this 10-piece set being perfectly crystal clear (so you can see what’s inside the container), it’s also stain resistant and the modular sizes stack beautifully for blissfully efficient fridge storage… and the little one on top, is just the right size for storing this peanut sauce for a few days! Best of all… they are “100% Leak Proof. Guaranteed.” That’s critical for me. For this recipe, I use chicken tenders, but you could also use a chicken breast, cut into strips. There’s a tendon that runs through the chicken tender. To remove it, place the chicken, tender side down on a cutting board, hold the tendon with one hand, and slide a sharp paring knife horizontally along the tendon. The marinade for this chicken is so aromatic, I just want to dive into the bowl. 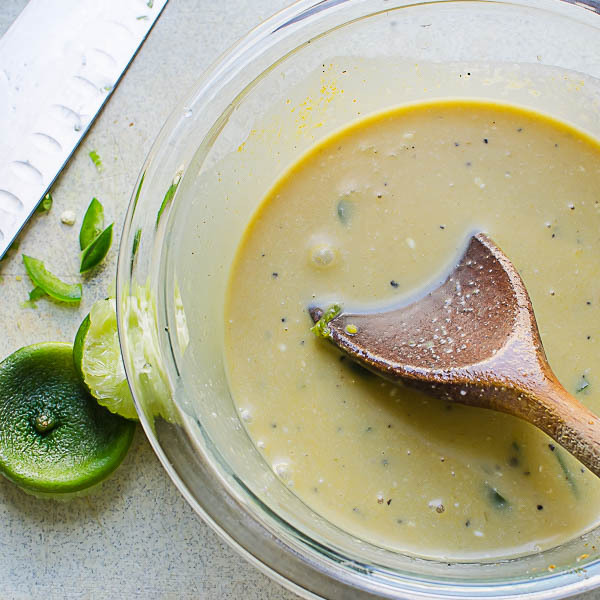 With ingredients like garlic, jalapeño, ginger, coconut milk, fish sauce and citrusy lime, you know you can’t go wrong! 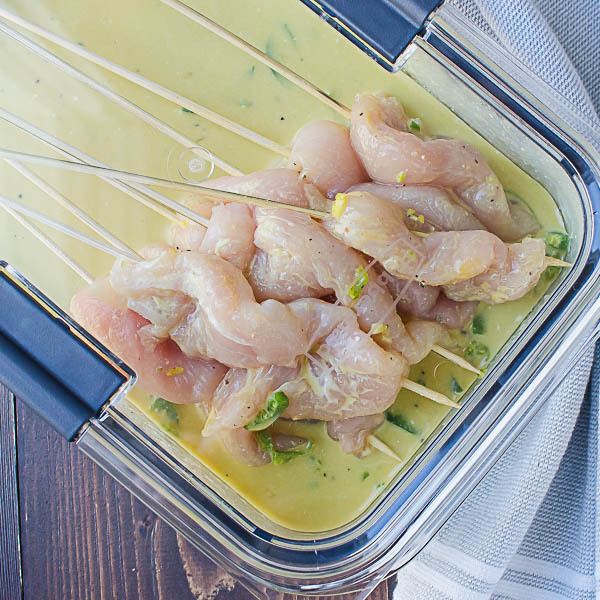 Pour the marinade over the chicken tenders (not the skewers) and let them soak up those flavors for 20 minutes to an hour. I used the large Rubbermaid® BRILLIANCE™ storage container for this. Every so often, I’d remove the chicken from the fridge and hold the container vertically (chicken side down) to give it a shake and make sure the chicken was well coated. FYI – that leakproof promise is true — I didn’t get a drop of marinade anywhere! Love that! While the chicken marinates, I do the beginning prep on the relish. Dicing the cucumber and red onion and assembling the dressing. I wait until just before serving to add the avocado and cilantro and combine it with the dressing. That middle sized Rubbermaid® BRILLIANCE™ storage container was the perfect size for the relish. Now for the fun… grilling! 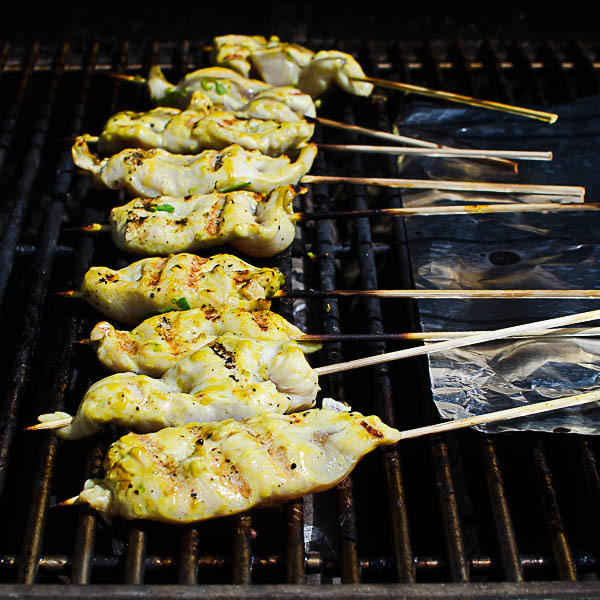 Place a piece of tin foil on one side of the grill (this is the area where the ends of the skewers will go — so they don’t burn). Place the chicken sates on the grill and cook for 1 1/2 -2 minutes. Flip them and cook for another 1 1/2 – 2 minutes or until they’re done. Transfer to a cutting board to rest for a few minutes. If you’ve made it in advance, the peanut sauce will solidify in the refrigerator, but no worries, just nuke it! Rubbermaid® BRILLIANCE™ is fantastic in the microwave because it’s splatter resistant! Just leave the side vents open to heat the sauce, without the mess! 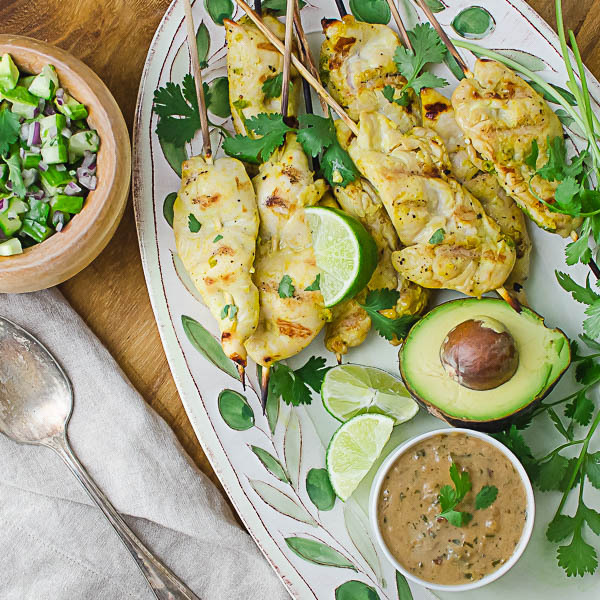 While the chicken rests, add the avocado, cilantro and dressing to the relish and get ready for an awesome dinner! The chicken is moist and flavored with spice and coconut. 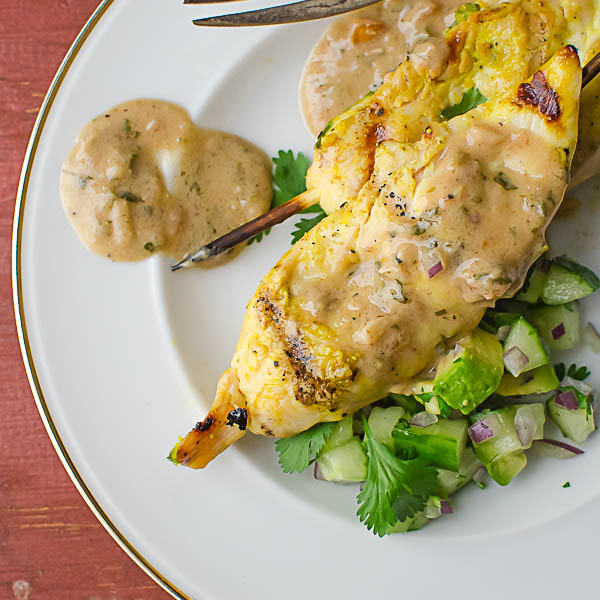 A drizzle of the rich peanut sauce is complimented by the tang and freshness of the cucumber avocado relish! I’m telling you, this is a flavor explosion! Cross my heart! 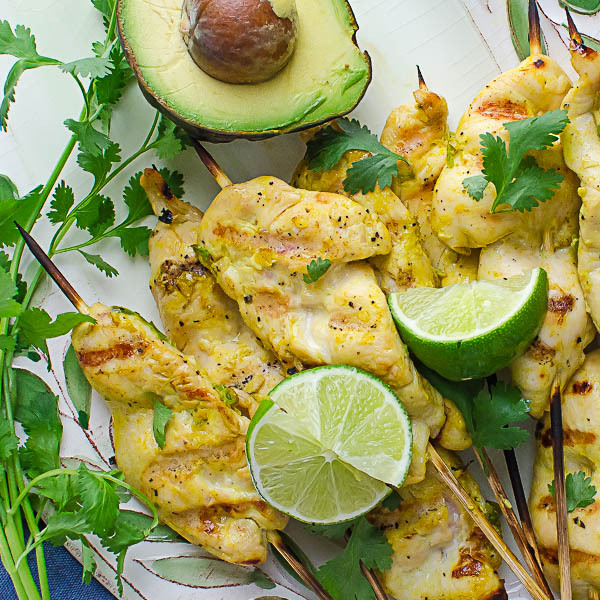 One of our favorite grilled chicken recipes (with a few of my own twists) from famed grillmeister, Steve Raichlen and his book, How To Grill. In a mortar and pestle, add the sugar, garlic, minced lemon, jalapeño, coriander, turmeric and pepper. Pound and mash the combination to a fragrant paste. 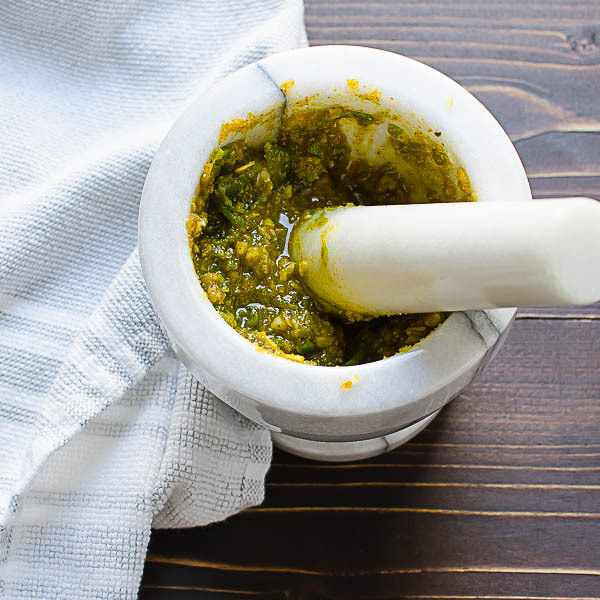 (If you don't have a mortar and pestle, place the sugar, garlic, lemon, jalapeño coriander, turmeric and pepper on a cutting board. Use the flat side of a chefs knife or santoku to rub and mash the combination into a paste -- the sugar acts an abrasive and the constant rubbing, will break down the ingredients.) Transfer the ingredients to a medium bowl and add the coconut milk, fish sauce, and lime juice. Set aside. Rinse the chicken and pat dry with paper towels. Each tender has a thick tendon that should be removed. Place the tender on a cutting board, tendon side down. Hold the tendon between your fingers and run a sharp paring knife along the tendon, keeping the blade parallel to the cutting board. Remove the tendon and discard. Thread the chicken onto the wooden skewers, weaving back and forth. 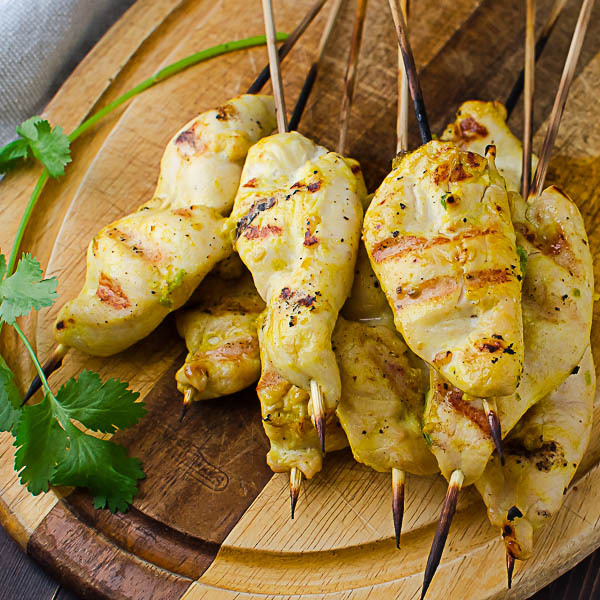 Pour the marinade over the chicken (not the skewers) and refrigerate for 20 minutes to an hour. Heat the oil in a small saucepan over medium high heat. Add the garlic, chiles, ginger and shallots and cook for 3-5 minutes, until golden brown. Reduce the heat and continue to cook until the garlic and shallots are caramelized, but not burnt, another 2-3 minutes. Add the peanut butter and cook, stirring for one minute. Add the remaining ingredients, reduce heat to medium low and simmer for 3-5 minutes, until the sauce is fragrant. If the sauce is too thick (it should be pourable), add water by the tablespoon until it thins out a bit. 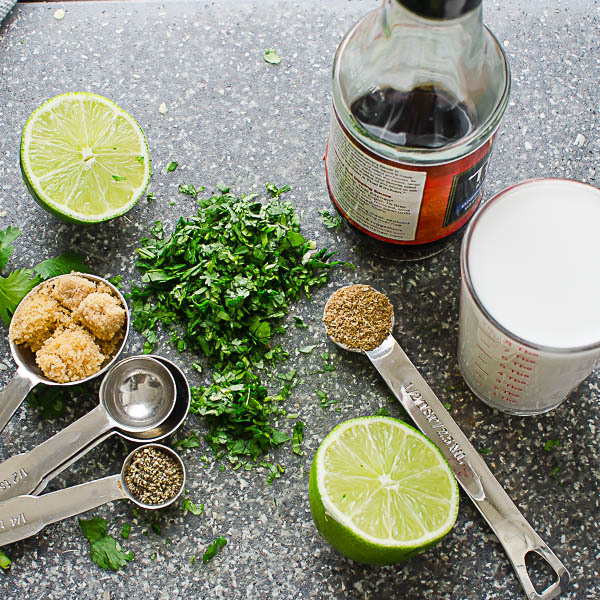 Taste for seasoning -- adding additional fish sauce, lime juice and brown sugar as necessary. Transfer to a storage container and refrigerate. 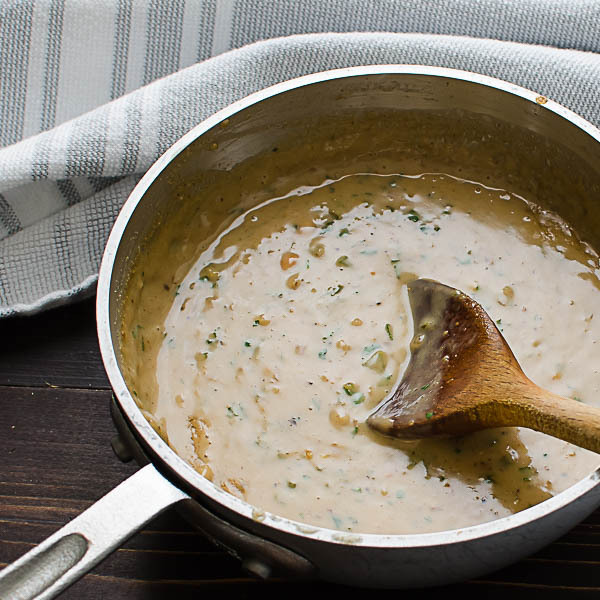 Sauce gets better after a few days so you can make this ahead of time. Place the sugar, garlic, salt and pepper in a mound on a cutting board. With the side of a chefs knife or santoku, mash the garlic into a paste, using the salt, sugar and pepper as the abrasive. Transfer to a small bowl and add the vinegar. Stir until the sugar and salt dissolve. Set aside. 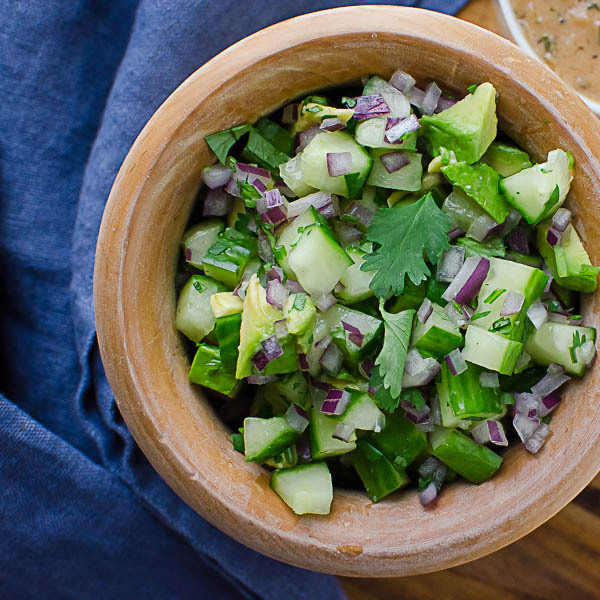 Combine the cucumber, onion and avocado in a bowl, add the dressing and cilantro. Toss to coat. 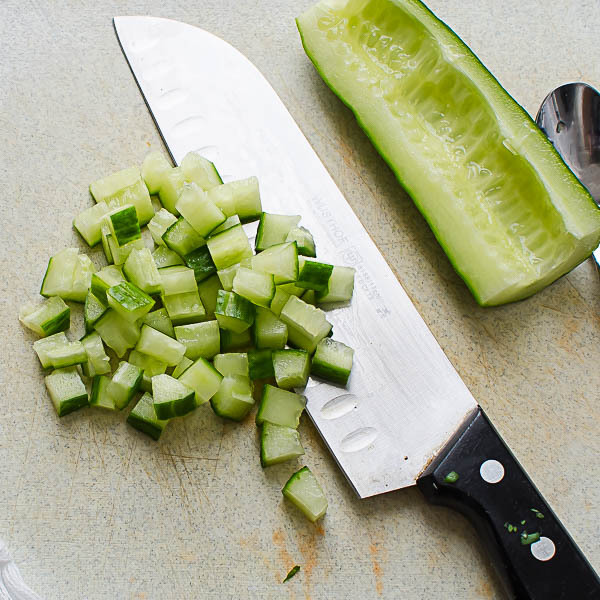 To make ahead - combine the cucumber and onion and refrigerate. At the last minute add the avocado, dressing and cilantro. Preheat your grill to a medium high heat, about 450°. Lay a piece of aluminum foil on one side of the grill. Place the chicken sates on the grill grates so that the "handles" rest over the aluminum foil -- this will prevent the skewers from burning and make it easier to flip. Cook the chicken for 1 1/2 - 2 minutes on each side or until done. Transfer to a serving platter. 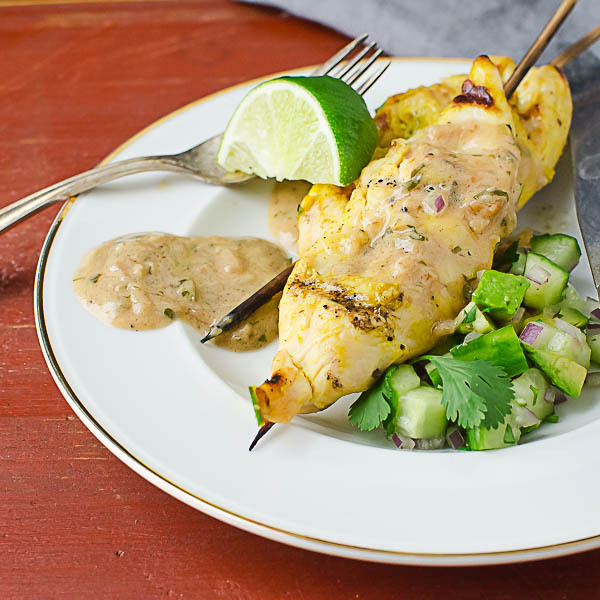 Serve the chicken with cucumber avocado relish, a dollop of peanut sauce and extra lime wedges and cilantro. This looks absolutely delicious and i can’t wait to make it!! By the way, I’m a HUGE fan of the rubbermaid tupperware. The suction is great, and my husband warms up leftovers without making a huge mess due to the venting of the top! I’m so glad you like it, Jamie! We enjoy these sates all year long. I agree on the Rubbermaid – they are fantastic all purpose containers. Wow! Does this look refreshing and delicious! The cucumber avocado relish sounds so stinking good and I love the coconut milk and peanut butter combination in your peanut sauce. I definitely need to try this amazing sounding recipe out ASAP! Well, please let me know what you think! We love the combo! Before I comment on your gorgeous recipe, can we talk about how smitten I am with the fact that the storage containers are stain resistant? I can’t even tell you how many containers I’ve ruined from staining! It’s so frustrating and I’m definitely going to look toward replacing my varied collection with the Brilliance. Onto your incredible-looking chicken dish. 🙂 What a fantastic pairing of flavors and textures! I feel like once I try this, I’m going to want to put that Asian Peanut Sauce and Cucumber Avocado Relish on everything. Really gorgeous pictures, too, Lisa. Such a lovely post! You are incredibly kind, Amanda! Thank you so much for your compliment! 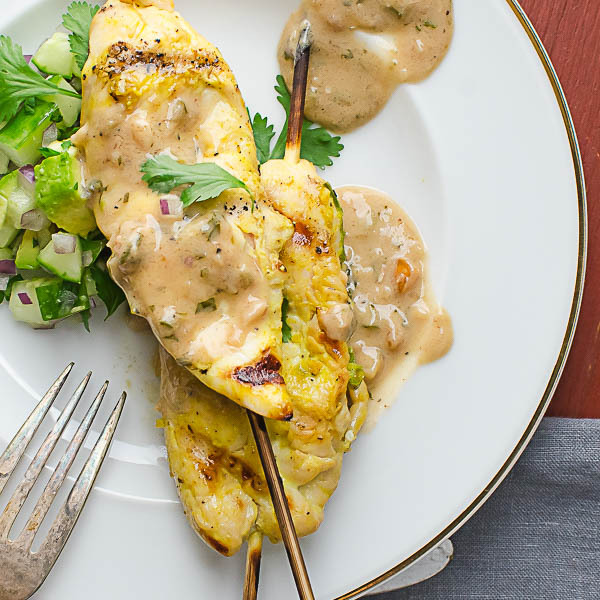 I have to say that this really is one of our favorite grilling recipes — and since much of it can be made in advance — it does come together pretty quickly in the end. And yes, these storage containers are turning out to be a real boon for us! Be on the lookout for them and let me know how you like them… Thanks! Stain resistant eh? Oh i’ll take that challenge! But seriously, much like Diversivore, I do love to put each ingredient or bunch of ingredients (if x,y,z go into the pan at the same time why not put them together?) in it’s own bowl/container so that I am organized before I start cooking, especially for something with as many parts as this satay recipe. I completely agree! Having your ingredients prepped and ready to go makes it so much easier when you’re actually cooking — and with the clear containers, you won’t lose track of what you need (cause that may have happened once or twice)! These look really delicious! I have to say, I’ve been making a bigger effort to invest in high quality storage containers, like these! In the past I bought the cheap ones and they constantly fell apart and ended up costing me more in the long run because I was constantly replacing them. I hear you, Jessy! Penny wise-pound foolish! Thanks for your comment. I love this recipe… I have really been watching what I eat and its wonderful to have a recipe that fits in my diet plan AND is packed full of flavor. Ive been packing a lot of food up in smaller portions for the diet…, I love that these containers are clear so I can see whats in them. There is nothing more frustrating than mistaking whats in it and getting to lunch and realizing you have the wrong container. I can’t wait to test them out on the no leaking guarantee…. Im really good at that! LOL – that would totally happen to me — you grab the container that you “think” is last nights soup and get to work to find out that it’s actually spaghetti sauce. Ugh! These sates are amazing! Enjoy! Oh my, this sounds like the perfect dinner! I wish I could grill out all the time like you! 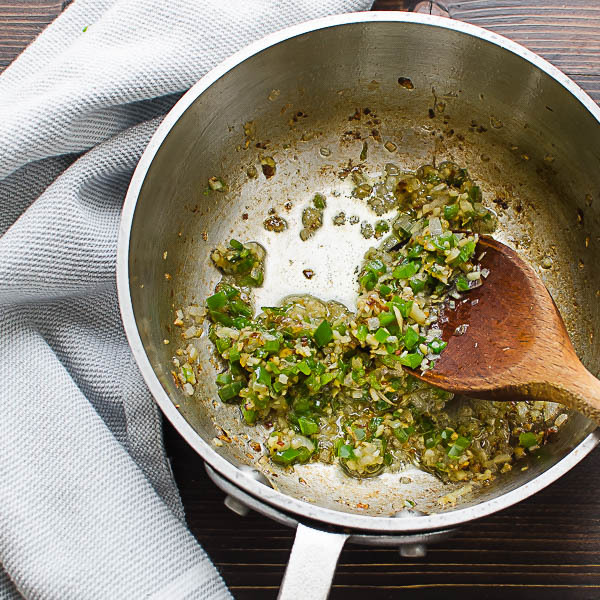 The marinade and the relish sound like the perfect combo and so tasty! The containers sound amazing as well, what a great thing that they are clear and stain resistant, those are such awesome features, I will so have to check them out! Leah, the Rubbermaid Brilliance storage containers are super handy — I’ve used them as an excuse to clear out some older/not as nice storage containers. Thanks for the tip about the containers! I will definitely be checking those out! I love putting my mise en place together ahead of time (when I can manage to be that organized, that is). There’s something so satisfying about pulling a bunch of little containers out of the fridge and knowing that everything is ready to go and perfectly organized before I start cooking. It makes the whole process seem that much nicer. 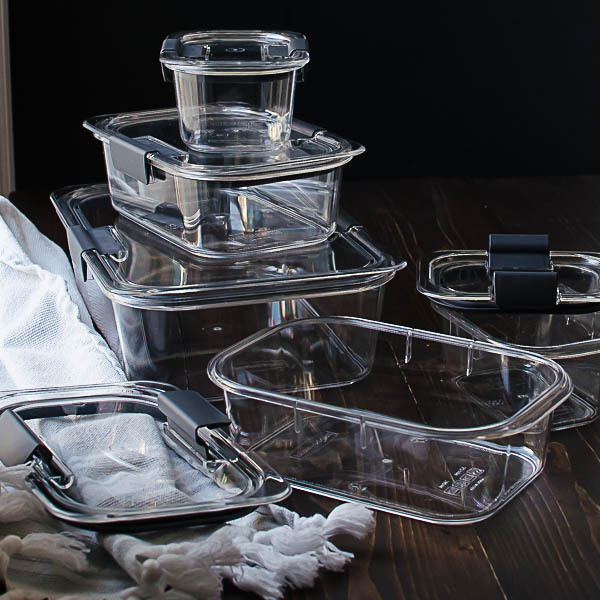 I must say those are gorgeous containers – I have tons of standard rubbermaid containers with the semi-opaque sides, but I do like the appeal of the clear ones. The shape is what really appeals to me though – straight sides (no wasted volume), variable sizes, and nice long, fridge-friendly shapes. I’m tempted to go look for these. 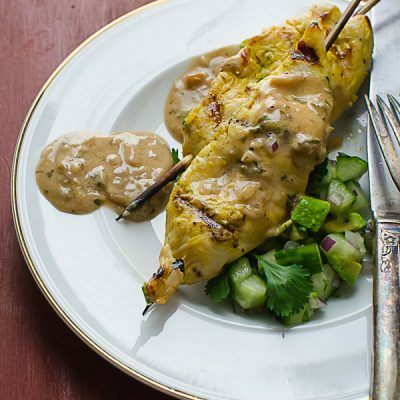 The recipe itself sounds wonderful – I’m always a fan of satay and I love the extra thought you’ve put into the relish. The ingredients sound perfect together, and I think that a well-balanced sauce (rather than a dollop-of-whatever) makes all the difference for a recipe like this. Cheers! You are spot on with your assessment of these containers — we love that they are crystal clear. They microwave like a dream, too because of those little vents in the snap on lid. The sate is just one of those dishes that hits every spot on your tongue — and then some! I really appreciate your comment – thank you so much for sharing. Let me know if you make this dish — I want to hear how you like it! This sounds amazing! All my favorite flavors combined! Thanks, Samantha! They make a great combo, I agree! I love that you could prepare the sauce a few days ahead. That makes it even easier to cook dinner during the week. Also love the look of those containers! Yes, leakproof containers are mandatory in my book. Don’t we love those make-ahead dishes? These pictures are gorgeous and the chicken looks equally delicious. 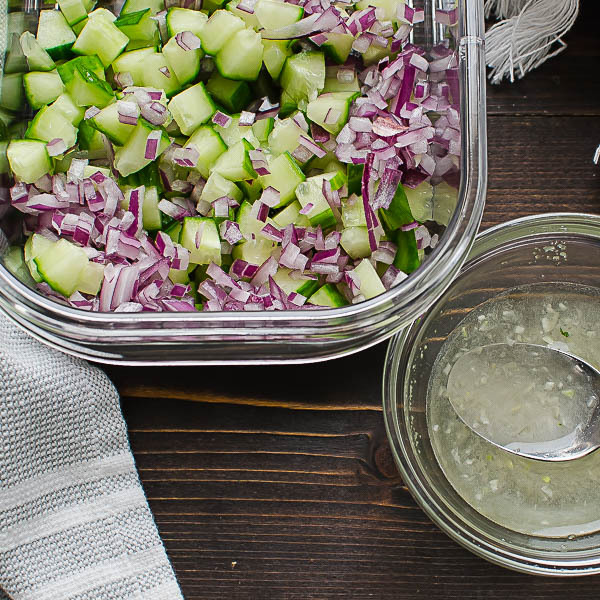 I’m also a HUGE fan of cucumber relish – I can’t wait to try this! Thanks for the compliment… I’m always working on my photography. These sates with the relish and peanut sauce are so yummy! You need to try it! That relish sounds amazing!! The whole dish sounds wonderful! 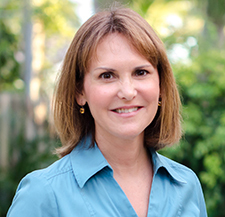 Thanks, Deanna! It’s really flavorful! I have a different Rubbermaid set that I use (and really like), but I’m loving how clear those are!!! Sometimes I can’t tell what’s in my containers because the lids are red– I end up holding them up in the air a lot. Lol. I’ll look for these! And I’m jealous of your year-round grilling weather!! The clear factor is important to me too — can’t tell you how many times I’ve forgotten what I have in some containers and by the time I look, they’ve turned. I’m in FL too so I totally agree…grilling is year round!! These sound great and I love those storage containers too! Thanks, Mindy! Where in Florida are you? Beautifully written and the pictures are lovely as usual. 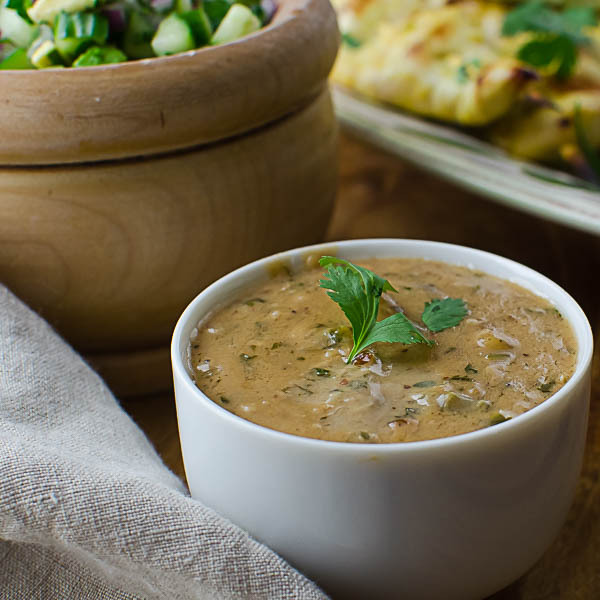 I’m a fan of peanut sauce and this recipe seems packed with flavor. Thank you so much! It’s a really delicious dish! Hope you enjoy! Mmm that chicken looks great! All those flavors sound amazing together! The Rubbermaid Brilliance food storage containers are great! I love that they are crystal clear so you can see what is in them and the clip that closes them really keeps everything secure. No need to worry about leaking! I love them! We thought so too, Katrina! Glad you’re getting good use out of them! And yes, this chicken is very tasty! Love all the delicious flavors you’ve melded together in this recipe. Like Florida, it’s almost always grilling season in Cali, so I’m all over this! Let me know how you enjoy it, Lisa! This looks delicious! I love all of the colors. So beautiful! I love food on a stick! That cucumber relish looks so refreshing! I love chicken sate! This recipe looks so good! I can see chicken sate in my near future! Glad you like it Elaine! This recipe is really a favorite for us. A wonderful combination of flavours! I need those boxes, they are beautiful! I wonder if they are available in the UK. Thanks, Nicole! I would check your local home goods stores to see if they carry Rubbermaid Brilliance.